The Porter Locomotive 4390 was built for the Santa Cruz Portland Cement Company located in Davenport, California during August of 1909. 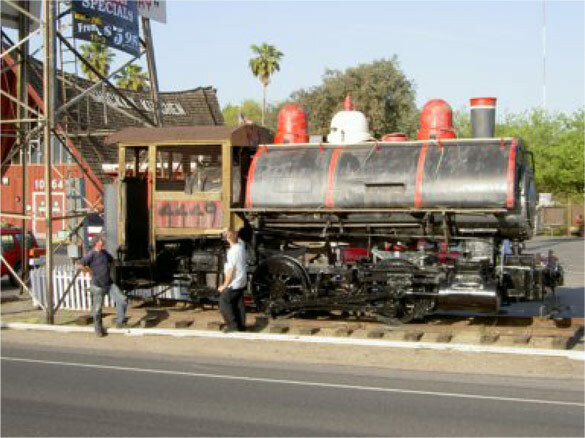 This locomotive has lead a long life serving SCPC until 1924 and later the Betchel Kaiser Rock Company of Oroville, CA until 1963. Since that time, the locomotive was stored outdoors and deteriorated a great deal. I purchased the locomotive in 2006 and after beginning restoration was looking for a paint which would withstand the heat of a steam boiler, paint over rust with minimal surface preparation, and be durable enough to stand up to the weather while restoration continued. After contacting the people at Rust Bullet and viewing their test samples I was very impressed with the product. Currently, I have used Rust Bullet to paint the exterior of the boiler and am happy with the results. The paint handled well and has produced a very durable membrane. I intend to continue using Rust Bullet for painting the rest of the locomotive as restoration continues. Steam locomotives are very demanding on paint due to high heat, mechanical abrasion, and exposure to the elements which is common for most of a locomotive’s existence. If it can work here, it can work anywhere.